Any book with a number in the title scares me. I try not to be too limited in my thinking, but I must admit that math gives me a panicky feeling. I know this is illogical. I try to talk myself out of it: I got an A in Algebra 2, for crying out loud! Apparently, the effort that A took left its scars. Big ones. I would rather give a speech to 2,000 Nobel Prize geniuses than repeat a single week of college Pre-calculus. 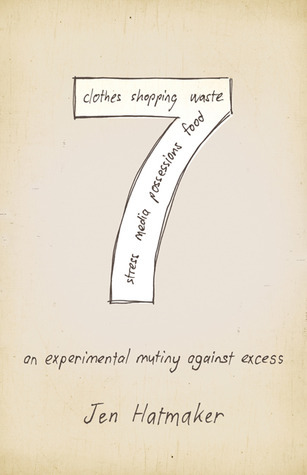 Maybe it was due to my aversion to numbers that I hadn’t really considered reading Jen Hatmaker’s book 7: An Experimental Mutiny Against Excess, though I’d heard a lot about it. Then some of my friends started sharing her blog posts on Facebook. I read them, and that was all it took for me to say, “Okay, I have got to read this woman’s book.” I’m really glad I did. I love Jen Hatmaker for making a thought provoking, challenging book that is so hilarious. I laughed out loud right in the midst of my musings on how catastrophically out of whack consumerism and starvation is in the world. (Okay, to be honest, I would have laughed, but my heart has been heavy due to a tragic event in our church family. That I kind of laughed should be a testament to how funny Jen Hatmaker is, because I was having trouble reading through my swollen eyes, and that is not an exaggeration). Note: From here on out, I’m going to call Jen Hatmaker just Jen, because she’s that personable and I don’t think she’d mind. 7 is a challenge that Jen gave herself to live with less in several different areas of life. The challenge areas are: food, clothes, spending, media, possessions, waste, stress. Each challenge lasted for 4 weeks. Her main premise is that our culture as a whole is “trapped in the machine of excess.” Her desire was to “fight back against the modern-day diseases of greed, materialism, and overindulgence.” I’m in agreement with Jen. The American Dream has gone from a desire for freedom to a desire for way more than we need. And it happens to be sucking the life out of us, one overworked, overeaten, over stimulated hour at a time. What’s worse, it’s sucking the life out of entire nations who aren’t getting any relief from their suffering because we’re too fat and happy to notice them. I’m talking about me, not you. Or maybe that is you, too. Whatever the case, this book was life changing for me. So much so, that I am beyond thinking about this stuff and ready to take actions. For each of Jen’s challenges, I’ve come up with a version of my own. Jen’s challenge: Limiting herself to 7 foods. Yes, just 7. My first reaction to this was, “WHY?” I came to see that she wanted a concrete way to discard the burden and the blindness that her love of food was putting on her life. I was more drawn to the challenge that several of her friends gave themselves for the first month: to pick seven of the world’s most poverty stricken countries and eat like an average person from that country for three days. They picked Haiti, Ethiopia, Uganda, Afghanistan, Bolivia, Cambodia, and Sudan. Jen and her friends came to understand more about their misuse of the food abundance in America and came away from it with a desire to do more for those who don’t have enough. Jen also realized what an idol food can become. My challenge: Pick my own impoverished countries that I feel particularly burdened for, research their average food intake, and eat like them for one day each. I wish I could do three days, but I’m a mom of littles, and I don’t want my family to suffer a grumpy, malnourished mother. (Who am I kidding, they suffer the grumpy mother regularly). I’m still working on fleshing out this challenge, because I’d like it to include a way to transfer my eating less to some hungry person eating more. Also, I’d like to add a book to my reading list about each impoverished country I choose. If you have any ideas, please tell me! Jen’s challenge: Wear 7 pieces of clothing for four weeks. Her discoveries about how she views clothing and how she expects other women to view her clothing were enlightening. Her honest evaluation of her excess clothing made me think twice, for sure. My challenge: Part 1 — Clean out my closet and give the excess to refugees. Part 2 — No clothes shopping for myself for 3 months. I think this will be an easy challenge, because I don’t really like to shop. I ignore clothes to a fault sometimes. You know, that moment when you realize you have nothing that fits the bill for the event you’re attending in, oh, less than half an hour. I don’t think about what clothes I need. Except for those new boots I promised myself last winter…. However, I think it will be an interesting challenge to share with my four-year-old daughter, who is a budding Fashionista. (Help.) I need to think through ways I can show her how abundant her clothing is and how some little girls have next to nothing. Jen’s challenge: give seven things away every day for a month. And not just to Goodwill, but to tangible people who will benefit from Jen’s entire family’s acknowledgement that they have way more than enough. My challenge: Same as Jen’s this time. I’ll be honest–I’m a little worried. I keep our house at a minimum of stuff to begin with. We get rid of things all the time. My husband hears “Hey, can we get rid of this?” on a regular basis. Still, our house feels cluttered. But the point isn’t to de-clutter the house. The point is to find good things we don’t truly need and give them to people who do really need them. I’m hoping to connect with a ministry that supplies refugees with basic household items for this month’s challenge and the clothing challenge. Jen’s challenge was a good old-fashioned media fast from everything not work related. I always think this type of challenge would be a no-brainer challenge for me. I don’t watch TV, what’s the big deal? But her challenge included blogs, Facebook, sports news, and everything else not work related. Yikes. No sports news! There would be troubles. However, I’m going to try it. My challenge: Limit my media to certain times during the day. I will allow myself to read blog posts from 6-7am. I will check/post to Facebook at 10am, 2pm, 9pm, or not at all. No internet surfing at all until after the kids go to bed. Otherwise, my media will only involve work-related or research related usage. My e-mail will have to be a continuous thing because it’s my main form of communication, but I think I can limit it to checking it every hour to two hours. And it’s football season, so…sports can’t completely go unless I want to spend hours away from family and friends on the weekends. Football is king in South Carolina, people. But I do plan to seriously limit it. Jen’s challenge: seven habits for a greener life. I’m summarizing it as a serious cutback on waste and use of natural resources. Before you roll your eyes at the liberal tree hugger, please know that I happen to be a conservative tree hugger. I was totally convicted by this chapter. Give yourself a chance and you will be, too. It’s sad to me that people who believe God doesn’t exist are so often the only ones concerned about God’s creation. I can’t put it as well as Jen does, but I hope you read this part if no other part of 7. My challenge: get Ella out of pull ups at night, buy less prepackaged food, recycle everything possible. Jen only allowed herself and her family (her husband was on board for all of this, by the way) to pay money out to seven vendors, two of which were online bill pay and her children’s school. This translates into no eating out, no shopping for fun, no family outings that cost money, etc. My challenge: Don’t buy stuff. Jen’s challenge: Keep Sunday as a true day of rest and pause seven times a day for prayer and reflection. My challenge: Stop clothes shopping. Oh, I kid. My challenge will be to (1) Become a planner and (2) Set daily goals for my gratitude journal. Much of my stress is caused by not planning ahead for things. Just this morning, I totally stressed my kids out with trying to get to MOPS on time (didn’t happen). I didn’t have anything prepared. It’s no coincidence that all the moms got a nice little reminder email about labeling sippy cups and bags this afternoon from the childcare workers–see, I’m spreading stress to everyone by my lack of planning! Those poor childcare workers. Anyway, the goal is to plan for the next day the night before. The other part of the stress challenge is based on Ann Voskamp’s Joy Dare. I have kept a gratitude journal for a long time, but I’m too sporadic for thankfulness to truly take root in my heart. Thankfulness isn’t thriving in me yet. I think stress would be obsolete if I could be grateful in my waking moments. I don’t consider myself to be a particularly stressed person, but then I think about the discontentment, the insomnia, the way I get fed up with the mess I live in, the inexplicable nightmares I’ve had since childhood, and I think there’s definitely proof of stress. The beauty is I truly believe it doesn’t have to be there. I’m going to strive during the Stress month of this challenge for peace that I know is attainable. So there are the challenges for the next seven months. I’m eagerly looking forward to tackling (most) of these challenges. My overarching desire is to find ways to positively help those who really need it. I don’t want to just simplify and clarify my life. I want to relieve pain in others’ lives, even oceans away. I hope you will cheer me on and give me ideas on how to do this when my brain is too consumed with the self control to not…buy…another…book! If you have the wherewithal to read this droning dribble about my 7 Challenge, then I guarantee you will enjoy the book 7 so much more. It will make you laugh and remind you that you have the power to make a difference in this world. And if you want to join me on my own 7 journey, you’re more than welcome.